More than 70% of NHS trusts and care providers are ignoring official guidance on offering infertile couples three chances at IVF, according to a report by an all-party group of MPs. 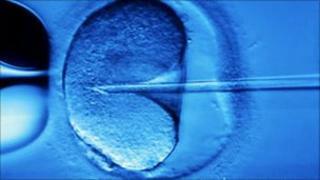 Some primary care trusts have stopped offering IVF altogether. Others are placing tough restrictions on who can qualify. The MPs say the result is a postcode lottery of care and are calling on trusts to implement the official guidelines properly. In 2004 the National Institute for Health and Clinical Excellence (NICE) said couples, where the woman is aged 23 to 39, should be given up to three cycles of IVF on the NHS. In the UK's devolved healthcare system this guidance applies to England and Wales, but will also be taken into account in Scotland and Northern Ireland. The All Party Parliamentary Group on Infertility sent freedom of information requests to primary care trusts (PCTs) in England, health boards in Scotland and Wales, and health and social care trusts in Northern Ireland. Their answers revealed 70% of the authorities contacted were ignoring the NICE guidance and putting in place strict limits on who could get the treatment. For example, at the time of the survey Bury PCT only allowed women to be treated between the ages of 39 and 40 - although since April of this year the PCT has offered IVF treatment in line with the NICE guidelines. The report says there was a similar picture in many Welsh Health Boards. However a spokesman for the Welsh Government pointed out that IVF treatment in Wales was a devolved matter. "Women in Wales are offered up to two cycles of IVF treatment where they are assessed as eligible against a set of nationally agreed clinical and social access criteria. The age criteria is women should be aged between 23 and 38.5 at the time of referral. "Over time, it is intended to provide access of up to three cycles of IVF as recommended by NICE guidelines." Others have restrictions on access for smokers, those who are overweight or if one of the couple already has a child - even if that child does not live with them. At the time of the survey, five PCTs - Warrington, Stockport, North Yorkshire and York, North Staffordshire and West Sussex - offered no IVF at all. A spokeswoman at NHS West Sussex said: "In line with NHS trusts across the country, we did have to face some tough decisions last year to ensure that we met our legal duty to break even financially. "Now we are in the new financial year, the decision we made last year on fertility treatment has been reviewed and funding has been reinstated for all eligible cases." In 2006, Clare Dando went to her PCT in Hampshire after realising that she would need IVF. But she was told that at the age of 33 she was too young, as the local policy was to restrict NHS treatment to those over 36 - even though her chances of success would reduce the older she got. She said: "Eventually we realised that time was ticking away so we remortgaged our house to raise £15,000. We had to pay for three IVF cycles ourselves and the last one in September 2007 worked. "Our little boy Alex will be three next week." The Hampshire guidelines have now changed, so one IVF cycle is funded for women aged between 30 and 35. Gareth Johnson, the Conservative MP for Dartford, is the chairman of the All Party Parliamentary Group on Infertility. He said: "It's clear that many PCTs are not giving IVF the priority they should. There are instances where it is being lumped in with tattoo removals. "There is always going to be a limit to what you can provide but the guidance from NICE says three cycles. "That's a fair balance between the needs of the patient and the burden placed on the taxpayer." Infertility Network UK has campaigned for more equal access to IVF treatments and says providers must follow the guidance from NICE. In a foreword to the report, Health Minister Anne Milton said many PCTs had made good progress towards implementing the NICE recommendations. "I am aware, however, that a small number of PCTs with historical funding problems have temporarily suspended provision of IVF services. "I have already expressed my concerns about this approach and would encourage all PCTs to have regard to the current NICE guidance." NICE is currently reviewing its guidance and will publish a report in 2012.